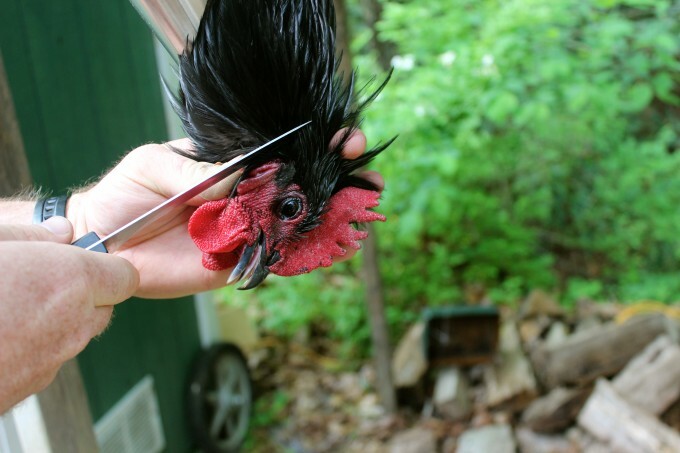 As my mentor, Steve Meeks placed the old rooster into the killing cone and took out his knife he said something, I’ll never forget. Wow. Is that really true? 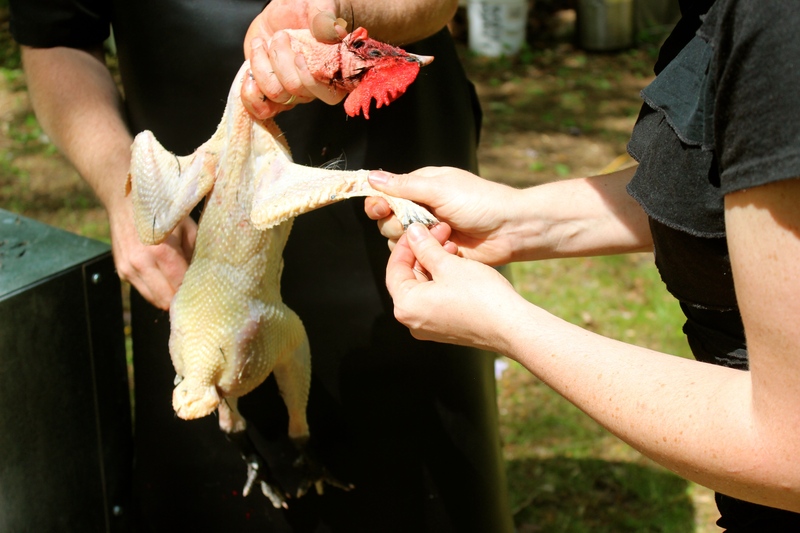 In this article I explain why you’ll want to butcher your own chickens and how to do it. At the end of the article, I’m offering a printable PDF bundle of my own product list, preparation checklist and the step by step instructions. For those of us wanting to grow our food and show more respect to the animals that provide that for us, we’re going to want to take the butchering process into our hands. 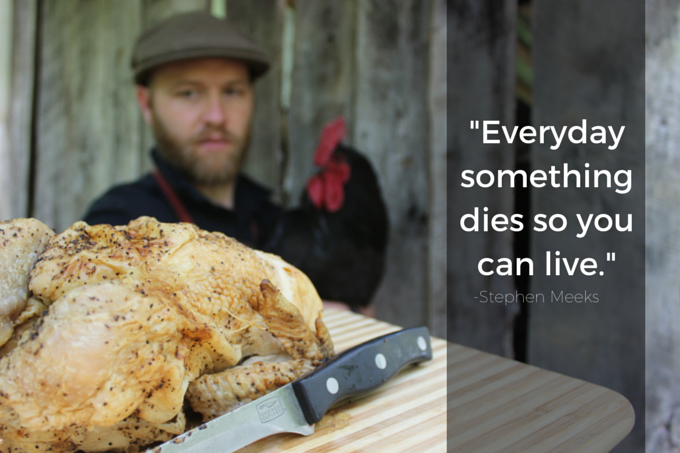 Processing our chickens means a much better death for our meat than the factory alternative. Here’s a quick micro documentary about a Purdue factory farmer. 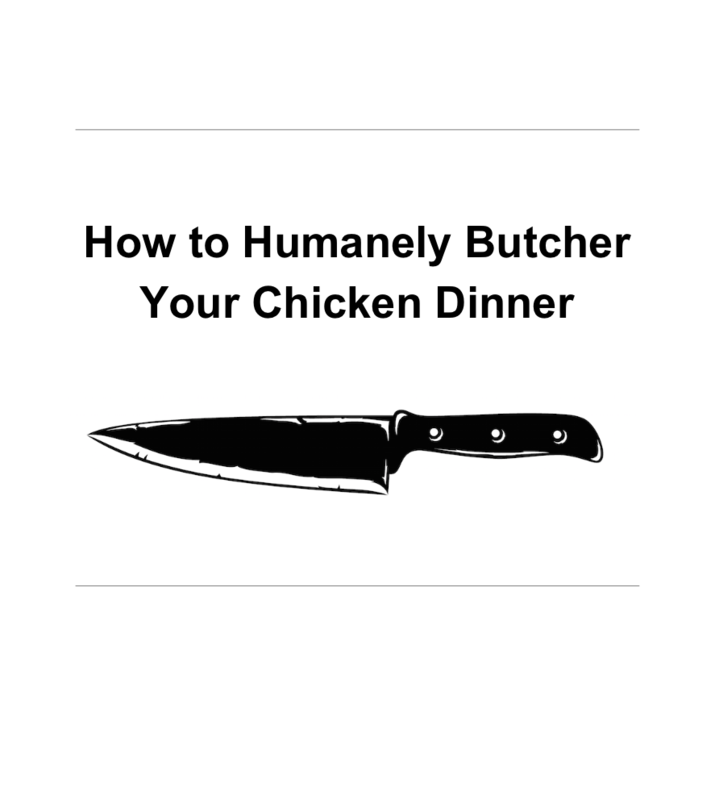 In this article, I’ll show you the tools you need and give you step by step instructions on how to humanely butcher your chickens. At the end of the article, I’m offering my PDF checklist and instructional guide to take with you to your next slaughter. 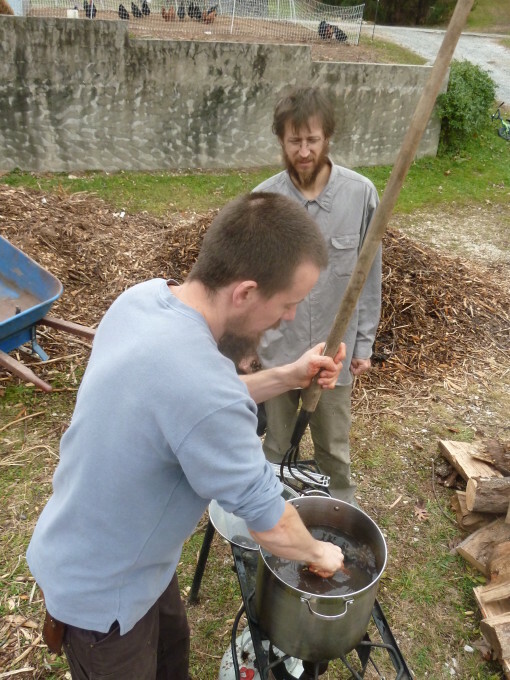 You could get the job done with just a knife, a cooking pot, fire and a bit of running water. You could get the job done with as little as a knife, scalding pot and a fire. However, adding some strategic tools and equipment can go a long way to processing your chickens more efficiently. Poultry Transport Cage is used to store the live chickens while you’re processing the others. An old cage we had on the farm is great for holding a few chickens before they’re butchered. 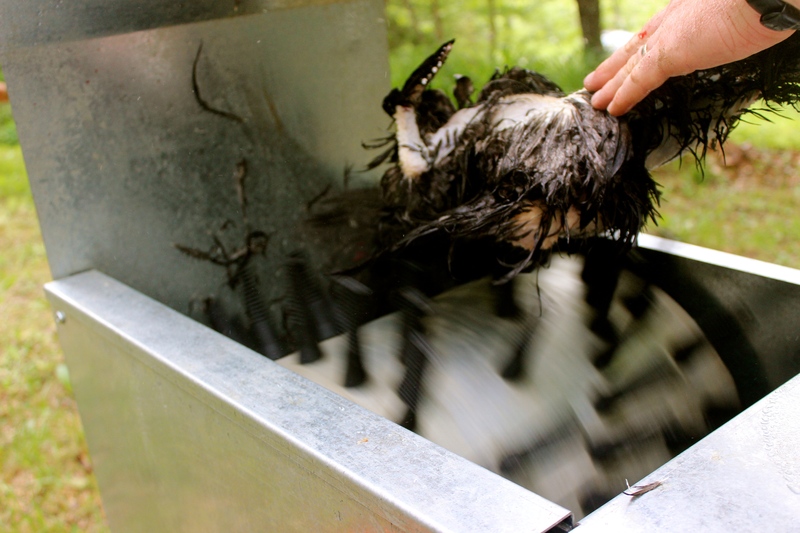 Catching the chickens and having them available for easy access is essential for a smooth operation. This cage doesn’t have to be anything fancy. I’ve used a mobile pastured poultry pen next to where we’re processing. For smaller numbers, I’ve used an old cage I had laying around the farm. 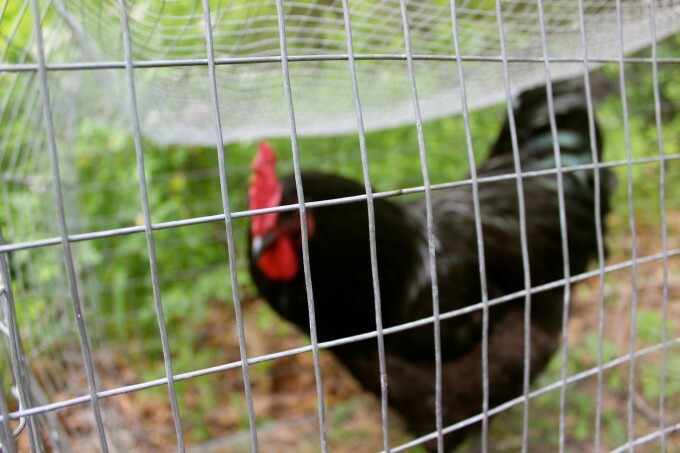 For more convenience, you could opt for a poultry transport cage. Restraining cones (also known as killing cones) work great for holding the bird in place while killing and they keep them in place if any nerves kick in after the kill and the bird begins to jump. This way you don’t have a “chicken running around with its head cut off”. Furthermore, I believe the action of putting them upside down causes the blood to run to their head, creating a sedating effect. I also believe the “hugged” position of the chickens in the cones serves to calm their nerves. 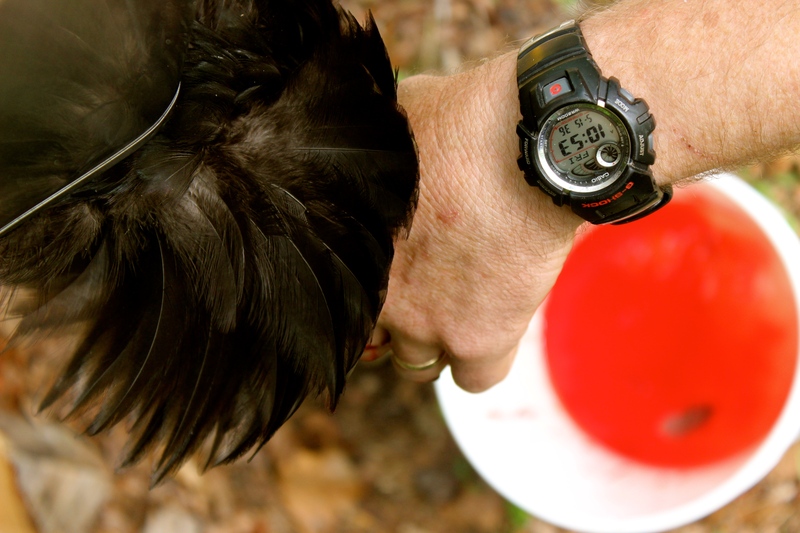 It’s very important to keep the chicken calm before the kill. 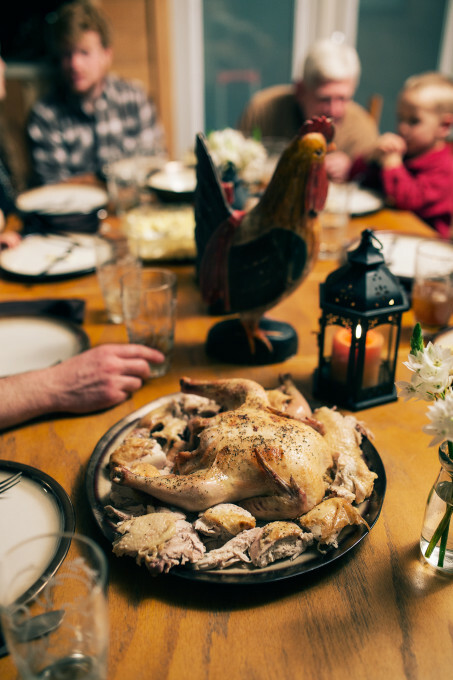 A stressed out chicken can mean a loss of glycogen levels which will negatively affect the taste, tenderness, color and keeping quality of the meat. We don’t want all our good husbandry over the life of our chicken to be in vain from some undue stress at the end of her life. For more info behind this theory check out this article. I’ve made my own restraining cones from used traffic cones mounted to a board. Another time I shaped some sheet metal for the job. I’m uncertain about the sanitation and health properties of the traffic cones and my sheet metal cones were flimsy and I was continually getting cut on them. Using traffic cones as restraining cones. I’ve finally opted for a stainless steel restraining cone. I finally upgraded to stainless steel restraining cones. If you have to forgo the killing cone option you could simply hang the chicken upside down with a string. Another option would be to use an apron to lay the chicken between your legs, head pointed down to do the kill. You can see a video of a very peaceful apron kill here. Sharp knives are essential. If you only have one, I suggest an all-purpose boning knife about five to six inches. 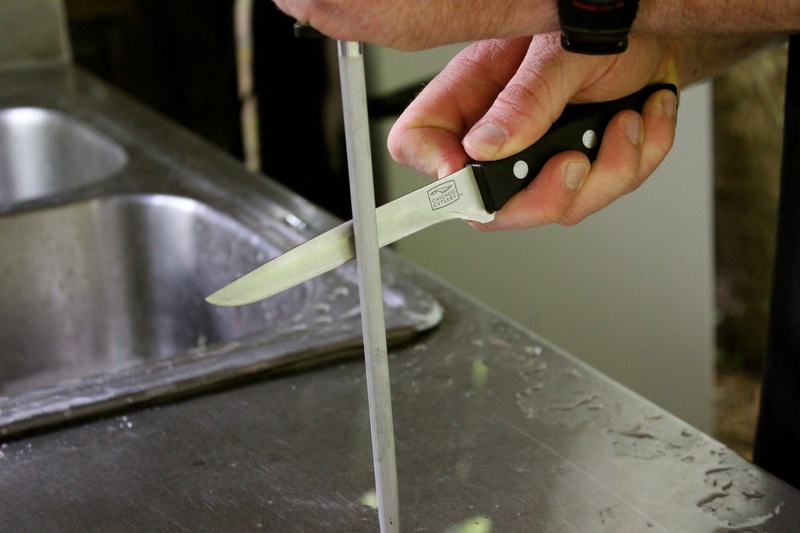 You could add a smaller knife (about a 3” blade) if desired for the smaller cuts. 6” multipurpose, deboning knife by Victorinox. Here’s a nice 3” knife by Victorinox. Here’s an 8” knife I use when cutting the chicken into pieces. For sharpening, I use Smith’s 6” Tri-Hone sharpening system that a friend gave me. For just under $30 it will do. One of the sharpening stones came unglued after just two uses, so when I have to replace it I might go with something like this. Using my round steel to sharpen my knife. For a video on how to use a honing steel checkout master bladesmith Bob Kramers video here. Pruning shears are used for cutting the head off (if you don’t want to pull it off) and cutting the neck off if you don’t want to keep the neck attached. I like the high-quality Felco F-2 Class hand pruners. A Waterproof apron for keeping your body dry. I got tired of getting soaked with chicken gut infested water so I bought the bullet and got a water proof apron. Waterproof boots for keeping your feet dry. I’ve been using an inexpensive set from Servas for years, but go through about two a year. I’d be interested to see if I spend more money I might get a longer lasting boot. I’ve heard some good things about Muck Boots from fellow permaculturists so maybe I’ll try a pair of those next. Muck even has a one year warranty! 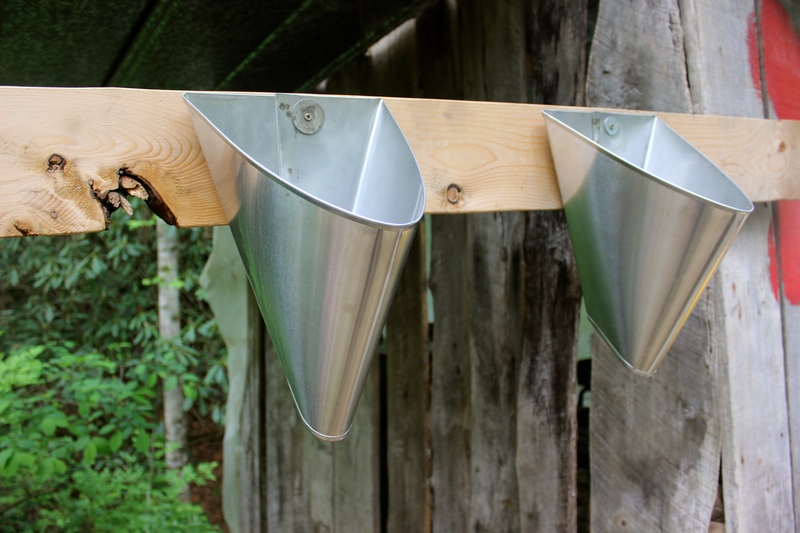 Buckets are a classic essential on the farm, and they’re a critical element in this operation. You might be able to acquire used buckets from a Grocery Store or Craigslist. You can certainly buy them at a farm, garden or food supply store, or online. 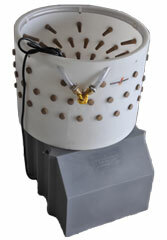 A Scalder is another necessity that could be as simple as a large cooking pot over an outdoor fire. While working at an orphanage in Honduras, I processed 600 chickens a day using one large pot over a fire. 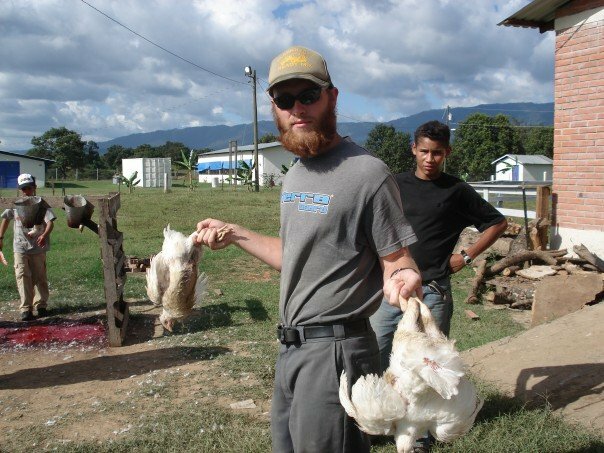 My first chicken butchering experience (in Honduras) where we processed 600 birds in one day! 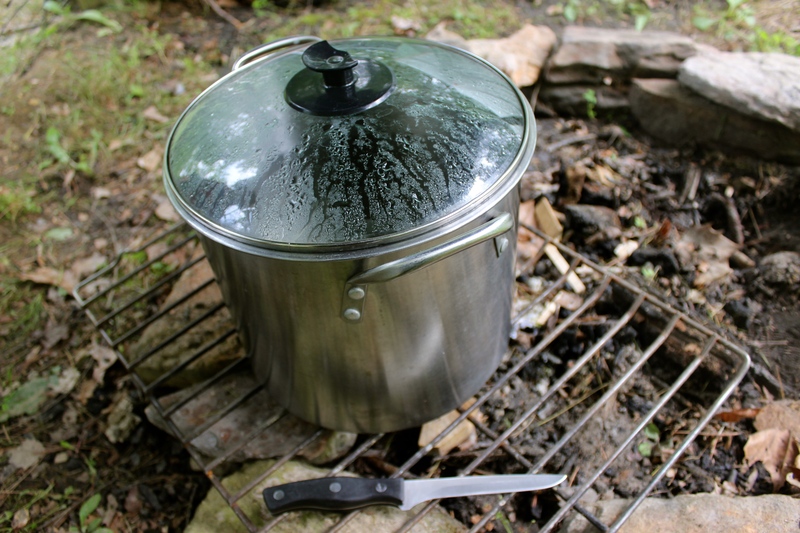 To make life easier, you could use an outdoor gas cooking stove for a bit more control. I used this one for years. 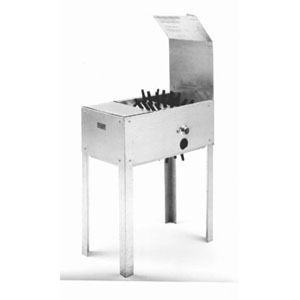 An outdoor turkey fryer has one burner and would work great for scalding. To make life the easiest, use an electric scalder. I use this one from Dux Industries and love it. The main advantage to this scalder is that you can set your desired temperature, and it will automatically maintain that temperature. With pots over fires and gas stoves, you have to maintain manually the temperature throughout the process. Temperature controlled scalders can remove all that stress and labor. You can make it more efficient by adding a styrofoam layer on the outside of the box for insulation and certainly use some kind of lid while it’s getting warm. Give the water a boost by adding warm water initially so it doesn’t have as much cold water to heat. If the scalding water has to start from cold water, it could take hours to heat up so plan accordingly. 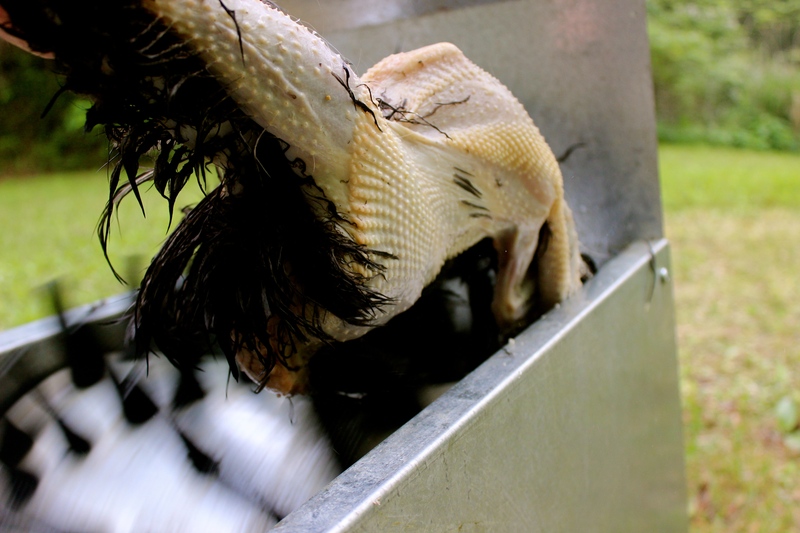 If you’re a bigger operation (processing 50 or more chickens at a time) you might consider a commercial grade scalder from Featherman or something similar. Featherman even has an automatic dunker and can do multiple chickens at a time. Liquid soap is useful in your scalding water and will go a long way to easing the tension between skin and feathers, making the feathers come out easier. I just pour a bit of Shaklee Basic H, but any eco-friendly soap will do. 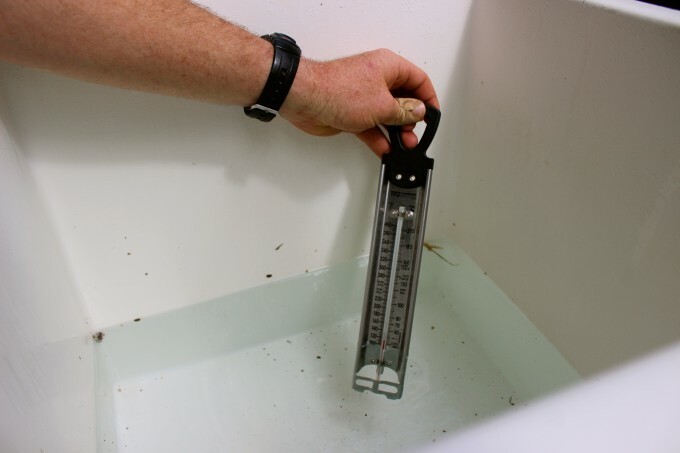 A thermometer is useful for monitoring your scalding water temperature. Even if you’re using an electric scalder with an automatic setting, you’ll want to monitor the progress of the warm up and double check your temperatures throughout the process. Testing the water temperature with a water proof thermometer. This one is sold as a candy thermometer and works great. 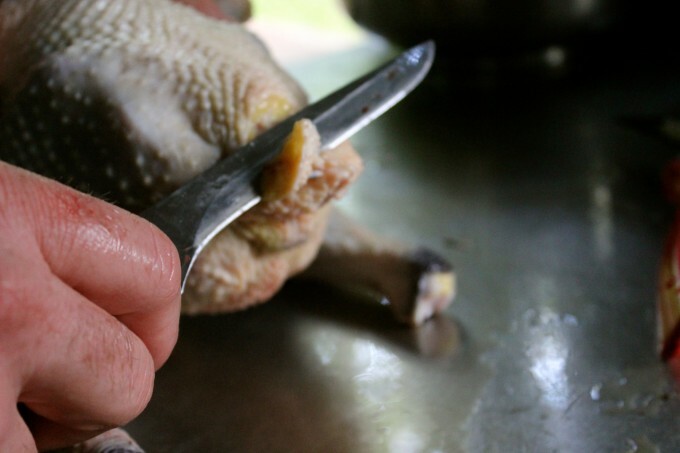 A scalding poker is some sort of poking tool to move your chicken around while in the scalder. 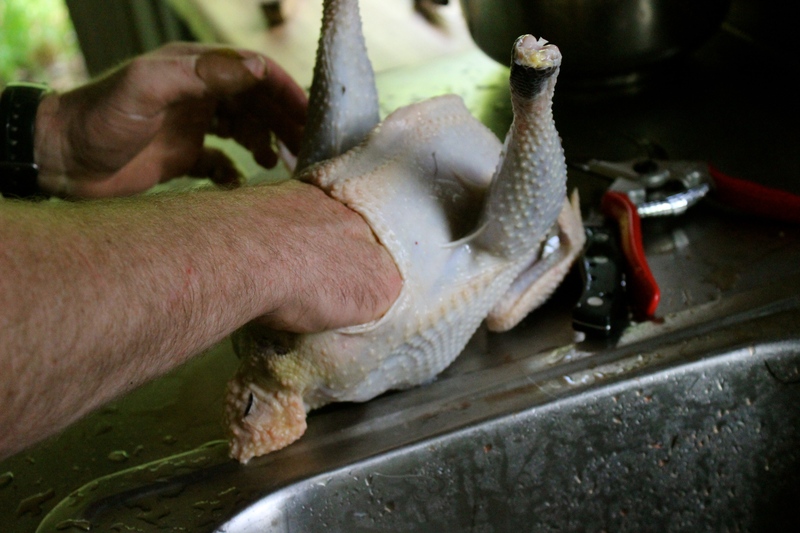 If you’re saving the feet (for chicken broth), you don’t want to scald the chicken by holding the feet because the feet will need a fair share of time in the scalding water. I use a hand held 3 pronged cultivator like this one. Here’s one similar to the one I have. Extension cords to connect to your power source (if needed). Here is an assortment of heavy duty cords. Power strip to connect electric scalder and plucker. Pick one up almost anywhere or browse Amazon for one. A Machine Plucker for plucking can make plucking a breeze. A plucker is optional, and not necessary if you’re only doing small amounts of birds or if you’re willing to pluck by hand. It takes me about ten minutes to pluck one bird by hand, but I can pluck a chicken in my machine plucker in about 30 seconds. Our intern, Desire’ can remember when her family of four would pluck their years supply of chicken in a single day (50 chickens total). This will pluck one chicken at a time and would be somewhat of an upgrade if you’re doing it by hand. A friend brought one of these to one of our slaughters, but we had difficulty rigging the drill to stay in place and to run without holding down the trigger. In addition, I don’t think we had a strong enough drill and it was just easier to pluck by hand. However, after searching the web, I believe there’re some better options out there. I almost bought this one just to showcase this, but I already have a heavy duty picker so I saved the money. This looks like it would work, but I’ve never tried it. Video of this plucker here. 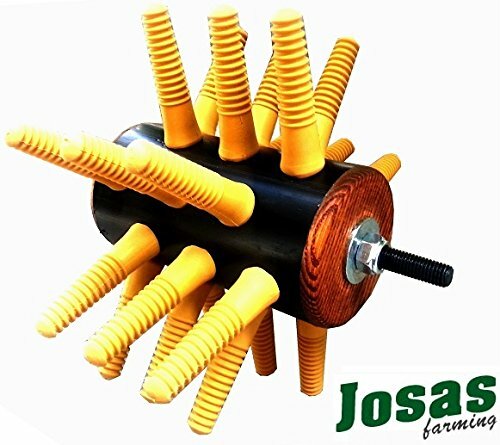 I’d love to hear from anyone who’s used a good drill plucker with success. 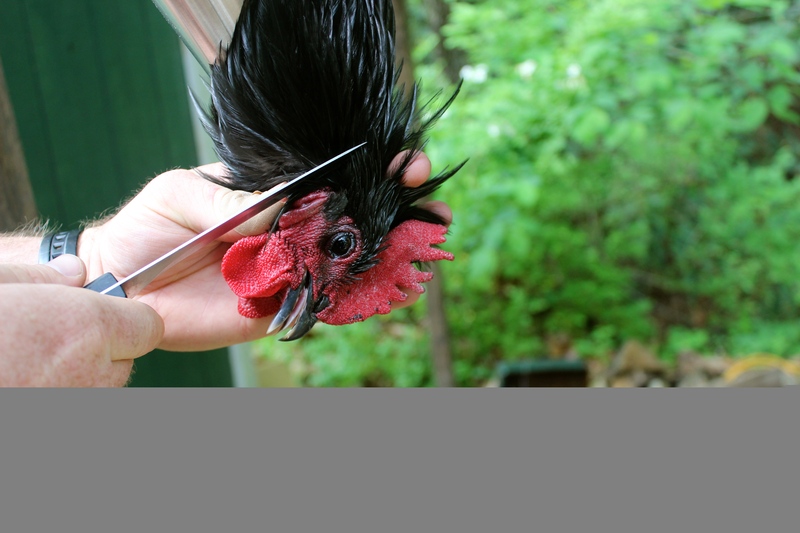 This will pluck one chicken at a time in about 30 seconds. I’ve pulled mine out for as little as just one bird and as many as 50. I personally use this plucker and believe it’s a great choice for the homestead level. I got mine from Strombergs Chickens here. 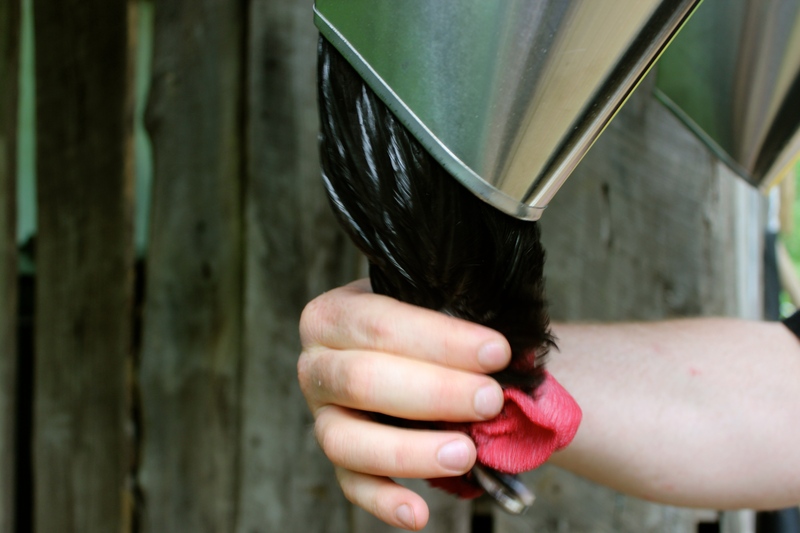 These will pluck 3 or more chickens at a time which can save you considerable amounts of time if you’re plucking great quantities of birds. These are the kind of pluckers Joel Salatin uses to process 100’s of chickens a day. Featherman seems to make some good ones. You can find those here. I rented one early on and found it quickly and easily plucked several chickens at a time, however I found it to be too large for my operation since I was never doing any more than 50 at a time. Speaking of rentals. It may be worth it for you to rent this equipment (if it’s available in your area). Look on Craigslist or call local farmers to see if they’ll let you rent their stuff. If needed, go in on the rental with some friends who need some chickens butchered as well. I rarely butcher alone, as it’s much more fun and efficient for someone to bring their birds and we all pitch in to get everyone’s chickens processed. Two friends who butchered with me back in 2013. 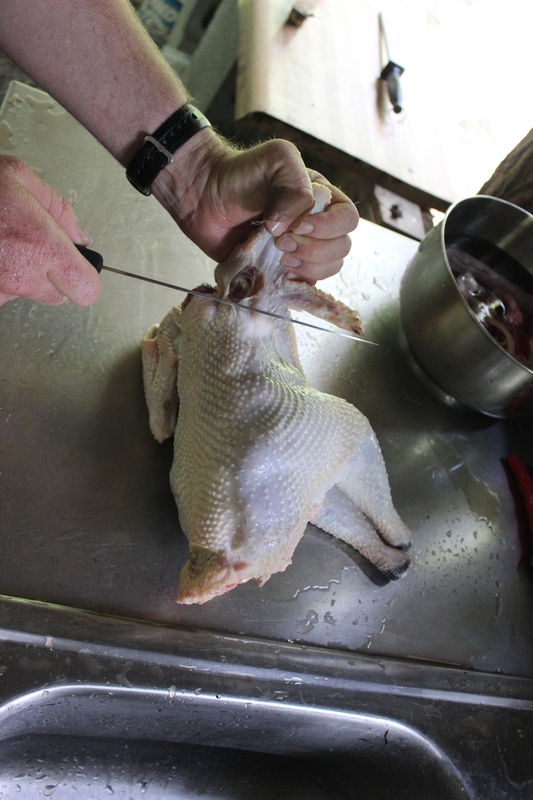 A Large cooking pot filled with cold water is useful for dipping the chicken in cold water to quickly cool the bird after the scald, therefore preventing it from scalding any further. A cooling pot isn’t totally necessary, but will give you more control and doesn’t take that much effort. You probably already have one of these, but if not, something like this would work great. A Sink and a Processing Table of some sort are a must. 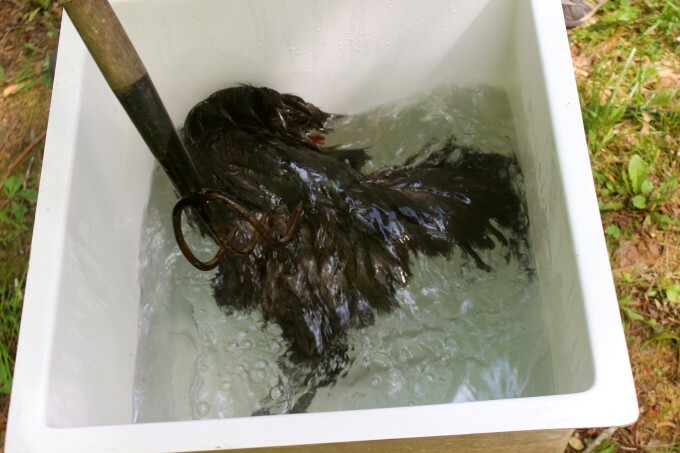 For small operations you could use your kitchen sink, but most prefer a designated sink for processing in any case. I picked up a double sink with a counter area at my local metal scrap yard for about $20. I bought a spray head kitchen faucet and added it to the sink, but you could use hoses with a garden sprayer. I use drinking water safe hoses since I’ll be spraying my own food. If your not interested in building your own sink and table, you could opt for a pre-made mobile butchering table like this. Or something a bit more elaborate and designed for two people like this. Hand soap and towels are great at the sink to wash up if you need to take a break. Stainless steel bowl(s) filled with some cold ice water are great for separating and storing things like necks, organs and feet. Choose one that fits your needs. Cooler(s) filled with ice water quickly chill the finished chickens after they’re butchered. 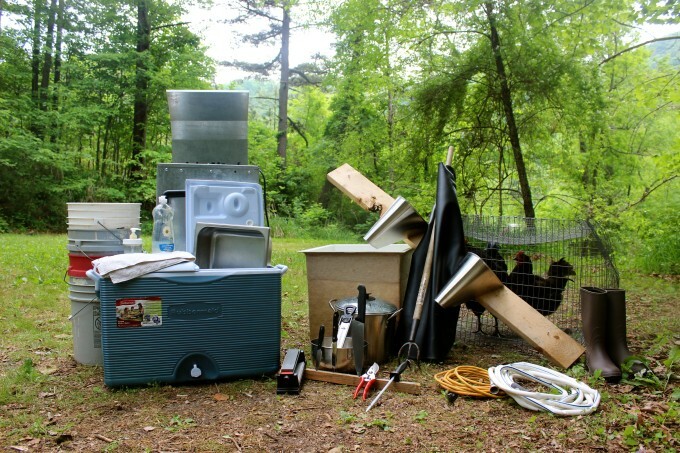 This isn’t necessary if you’re only processing a few birds, but if you’re going to be out for a while, store your chickens in cool water. Any home cooler will do, but if you need something larger and dedicated for butchering, consider a heavy duty one like these. Transport Tray(s) are good for transporting the chickens from the cooler if need be. I use stainless steel trays to transport birds inside to my wife Rebekah, who’s dries them off and preps them for the fridge. We process more chickens than would fit in the cooler, so I make a few trips inside. Someone gave us ours, but this one is just like ours. Dry Rack or Towels for drying the chicken before bagging for storage. Vacuum sealer for getting excess air out of the storage bags to prevent frosting while in the freezer. We picked up your everyday vacuum sealer at Target. Here’s our vacuum sealer on Amazon. Bags for storing the birds. 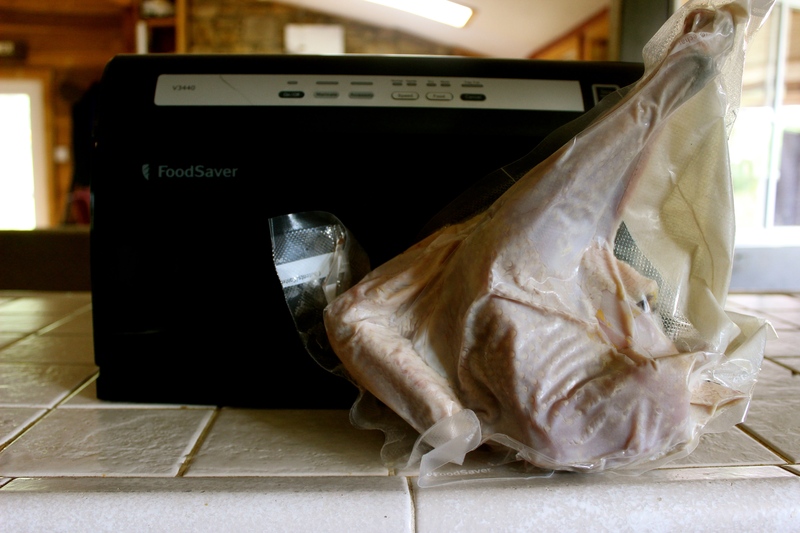 I use the specific vacuum sealer bags (1 gallon or rolls) that go with my vacuum sealer. Food Scale for weighing the finished birds if you like. I just use a small packaging scale, but any food scale should do. We alway mark them by weight with a sharpie so we can plan our cooking. Now that we’ve got all our supplies, let’s prepare to butcher. One week before – Go over your checklist and order or pickup any supplies you might need before butchering day. One day before or early the day of butchering. Designate an area for processing that’s shady, has access to electricity and running water. Set up your processing area the day before or early morning the day of slaughter. 12 Hours Before – Withhold feed to make sure their crop is empty. This is not a necessity but makes it easier and cleaner when processing. I just separate the chickens I’m going to butcher into a cage or a pastured poultry pen (depending on how many I’m processing) before I feed the morning of the butchering (since the chickens don’t have feed at night). 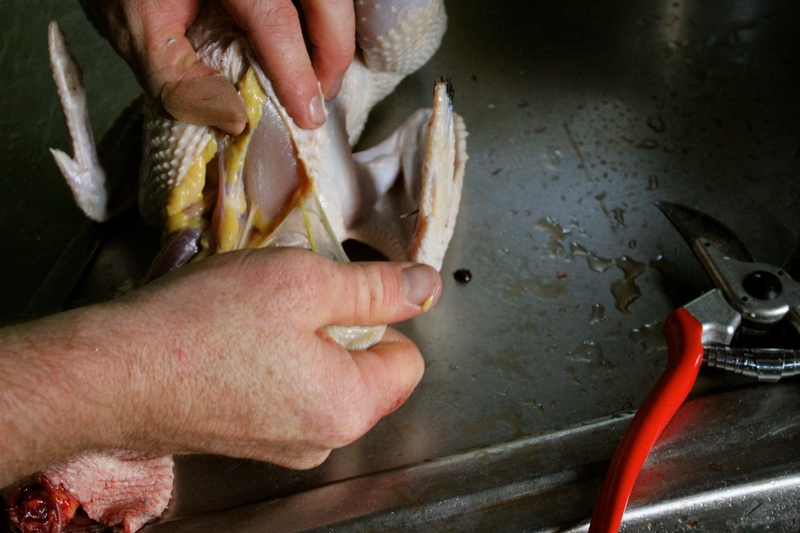 2-4 Hours Before – Get your scalder going in plenty of time to get to your desired temperature. It can take several hours for an electric model or a fire to heat water up to 145 degrees, so plan accordingly. The following section includes graphic descriptions and photo’s of a real chicken butchering intended for human consumption. 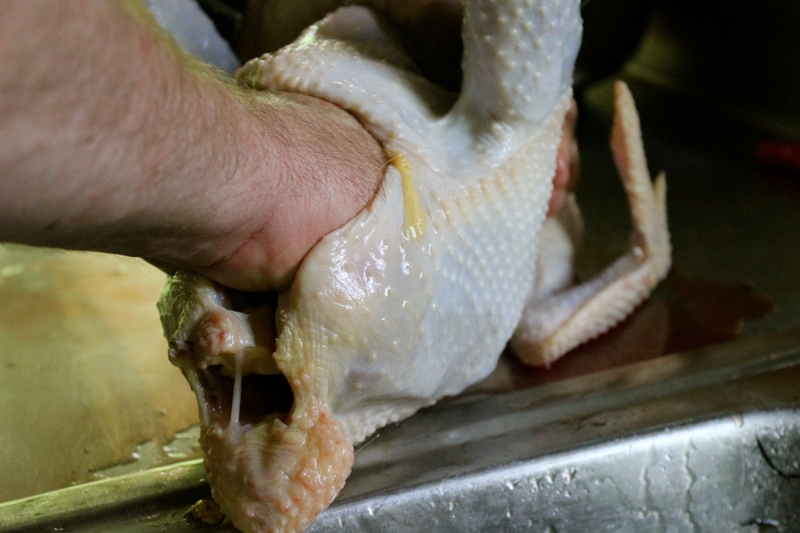 Step #1 – Place the chicken in the restraining cone and gently pull her head through the bottom. Gently put the chicken in the cone, face out. Step #2 – Hold the head with your subordinate hand and quickly, slice into the side of the neck as close as you can get towards the cheek bone (this optimizes the amount of neck you can save). Be sure to slice hard enough to get through the skin and into the blood veins but not too hard as to begin cutting into the neck and/or windpipe. Once you’ve cut the major artery they will lose consciousness and will feel no more pain. The chickens nerves might kick in and they will begin to jump, but rest assured they are unconscious or even dead and don’t feel a thing. Here I show you where to cut. Just above the cheek bone. Step #3 – Quickly slice the other side of the neck to encourage a quick bleed. 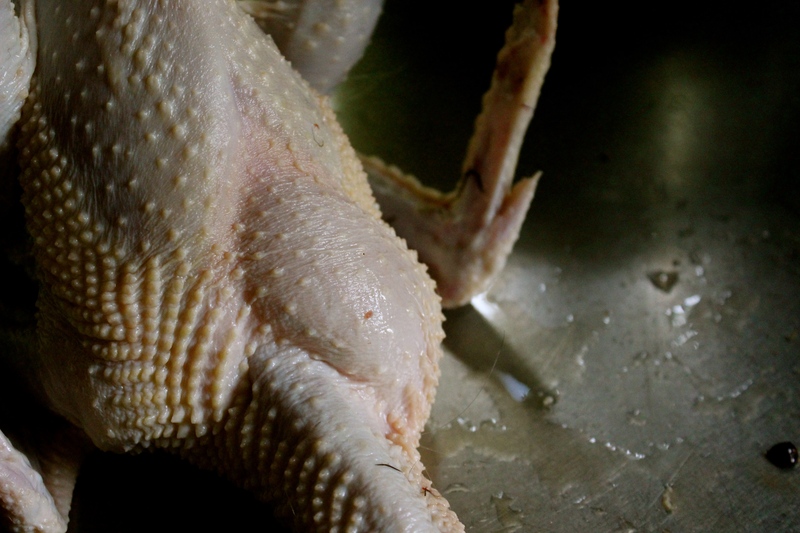 Have you noticed purple, red and black spots inside of chicken meat from the grocery store? This is because they were most likely electronically stunned before they were allowed to bleed. Stunning will cause the heart to stop, therefore not allowing all the blood to get out of the meat. 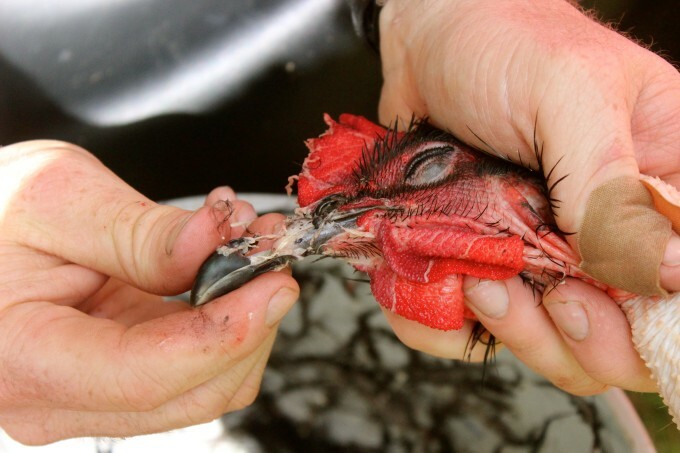 Step #4 – Bend the Chicken’s head to encourage bleeding and hold her head steady, if her nerves cause her to shake. If there’s lots of blood coming out, you’ve made a successful kill, if not, you’ll need to quickly slice again until sufficient blood flows. She’ll bleed a lot initially but will slow significantly after the first few seconds and will trickle to 3 minutes. Notice the bucket below has water in it The water prevents the blood from gelling and sticking to the bucket (making it hard to clean). 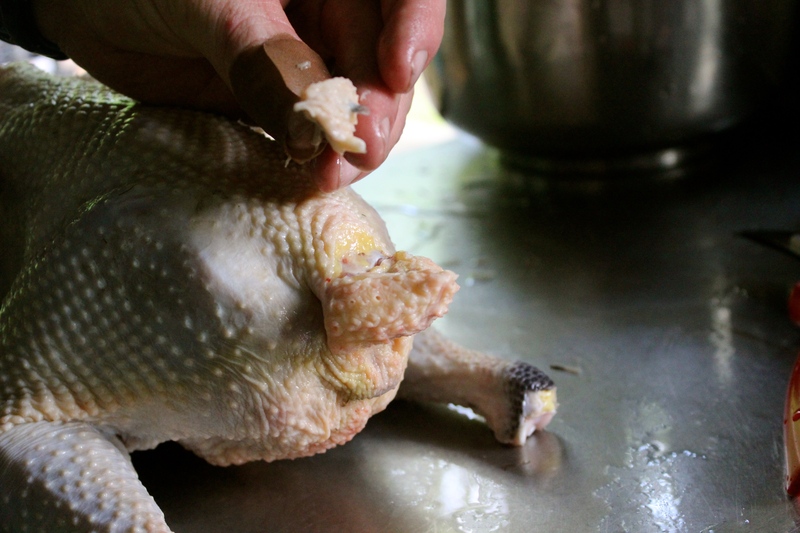 Step #5 – Place your chicken in scalding water. Notice I didn’t say boiling water. I like a temperature of about 145 degrees. 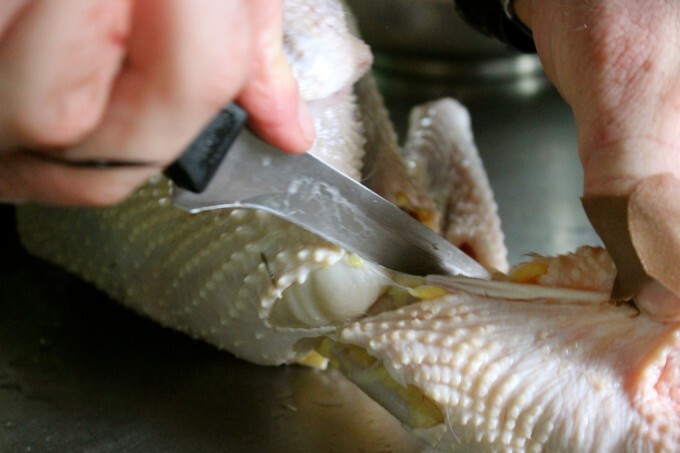 Step #6 – Thoroughly and evenly scaled by moving the chicken around with some sort of poking device. At 145 degrees it takes 30 seconds to a minute. You can test the bird during the scald by pealing at her feet and/or her wings. 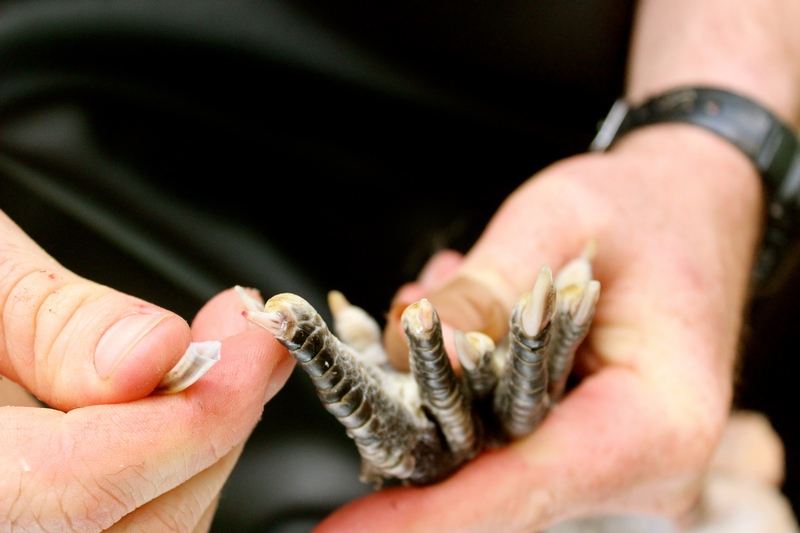 If her feet easily peel and the wing feathers easily come out, the scald is good. 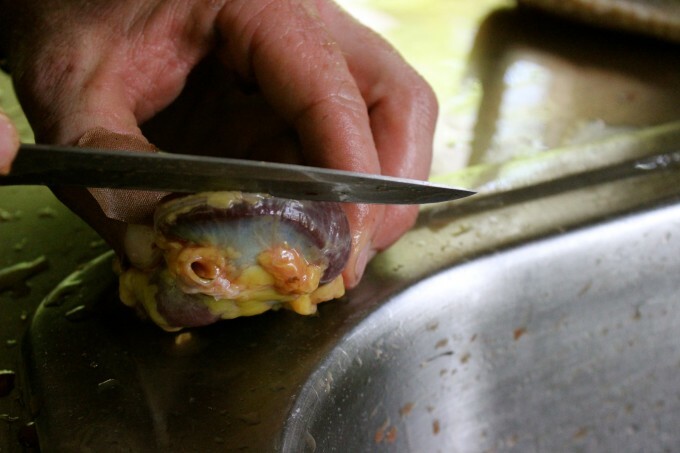 If you don’t scald long enough, it will be more difficult to pluck. 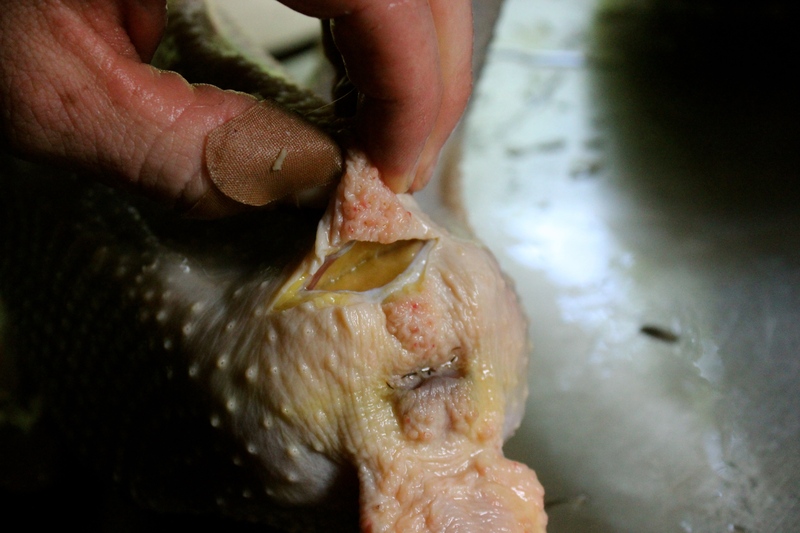 If you scald for too long your chickens skin will begin to cook and might begin to peel and be discolored (yellowish). 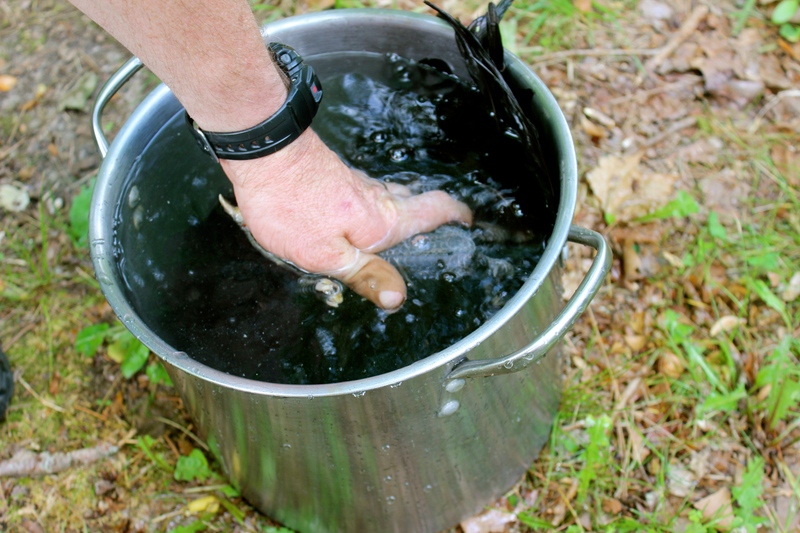 Step #7 – Dip the scalding chicken into a pot of cool water to stop the “cooking” process. 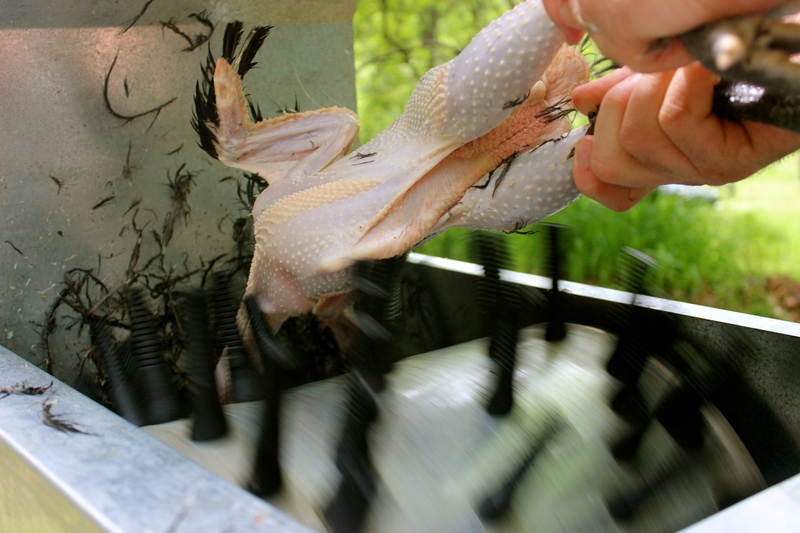 Step #8 – Pluck the chicken by hand or speed up the work significantly with a machine (up to 10X faster). A machine plucker can speed up the process 10X or more. 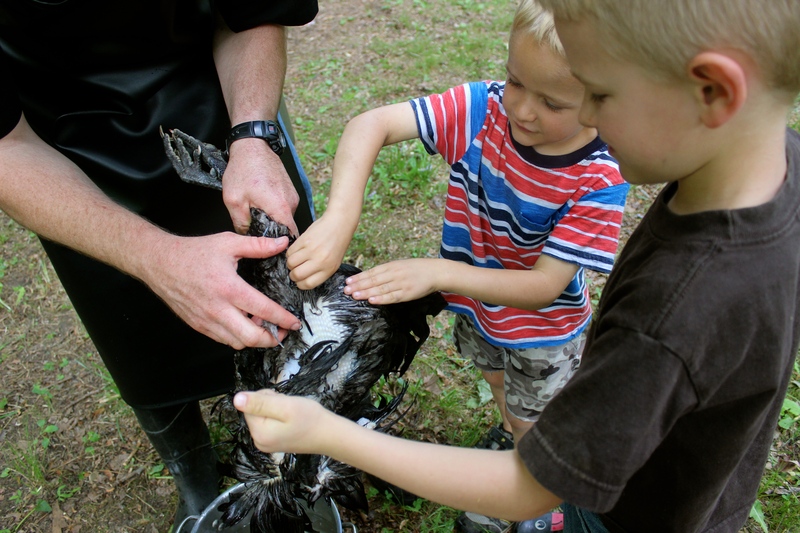 Step #9 – Pick off any excess hair or feathers. 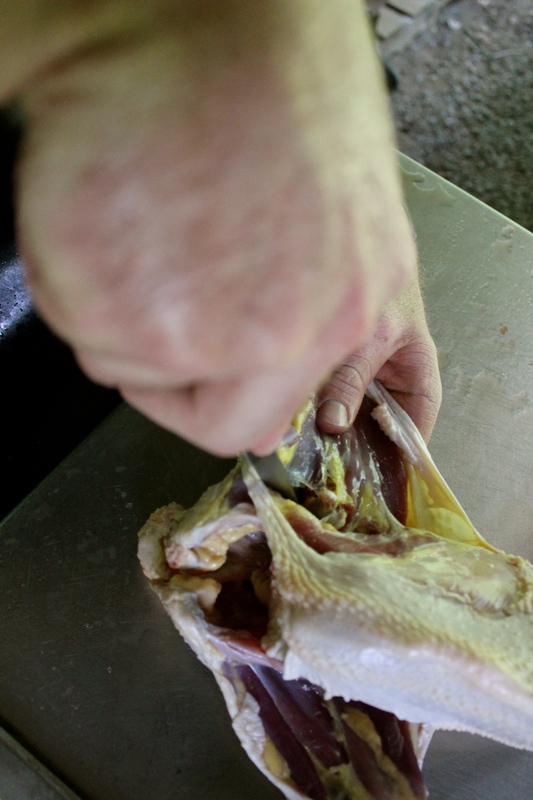 Step #10 – Pull the skin off of the feet. Step #11 – Remove the toe nails by bending and pulling against the curve. Step #12 – Cut off the leg by cutting between the joints. 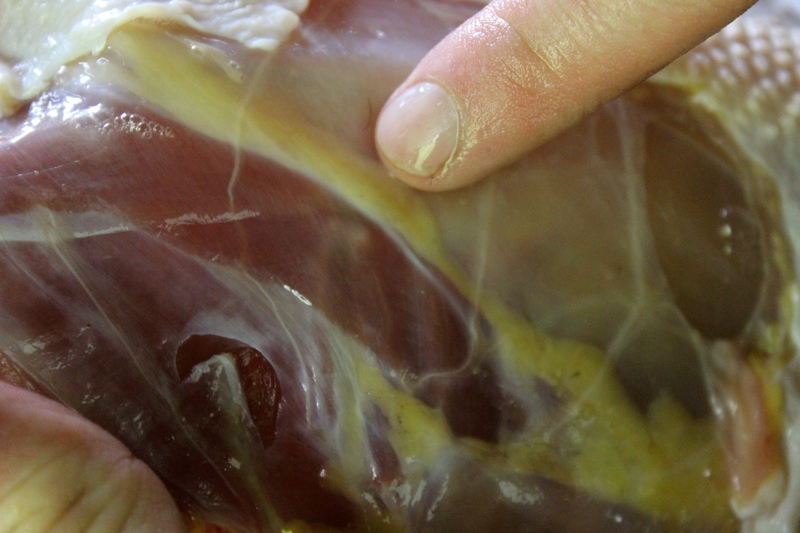 Lifting the chicken can help reveal the joint. 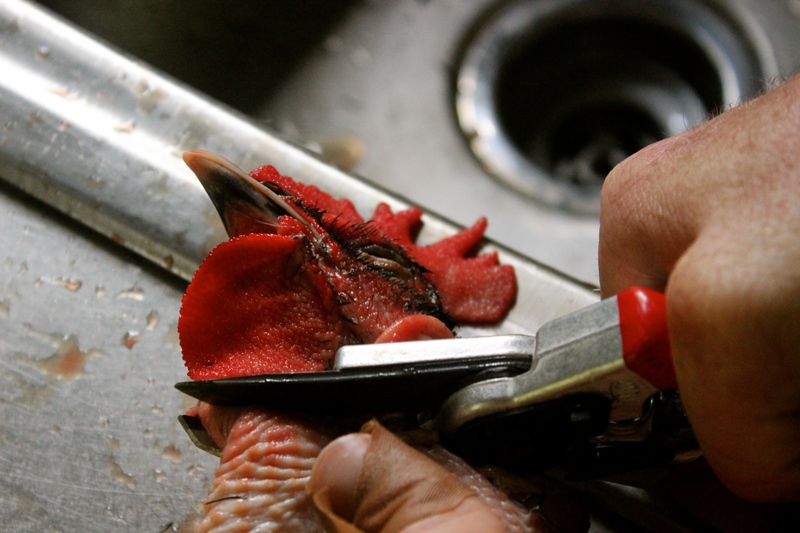 Step #13 – Pull or cut off the head with your shears. 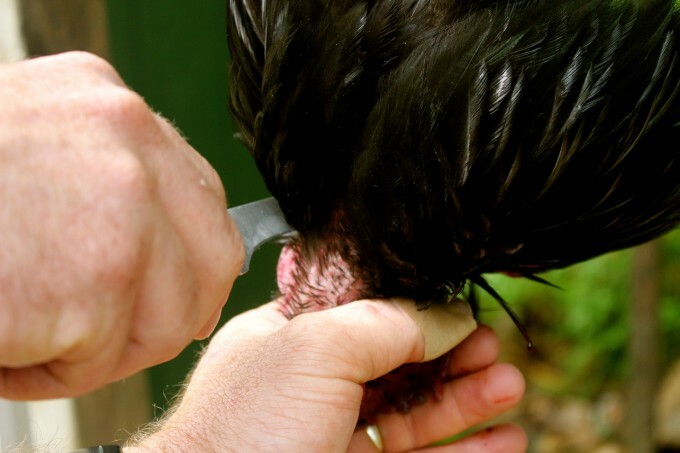 Step #14 – If you’re going to save the head for cooking, rub the coating off the comb and wattles and pinch the beak to pull off the cuticle. Step #15 – Singe if desired. You’ll notice small hairs are likely to remain on the carcass. You can remove them if you like by hand or with a singe torch. However, there’s no harm in keeping them. I manually pull out any major patches, but other than that I don’t really worry about it. Step #16 – Cut the skin around the base of the neck to reveal the crop. Notice the bulge? That’s the crop. This crop seemed to be filled with air and water. 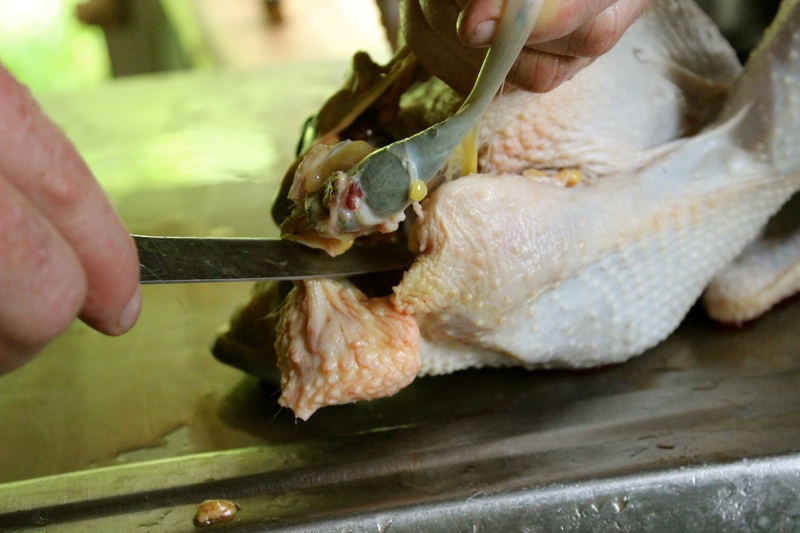 Step #17 – Peel the crop downward off of the breast bone. 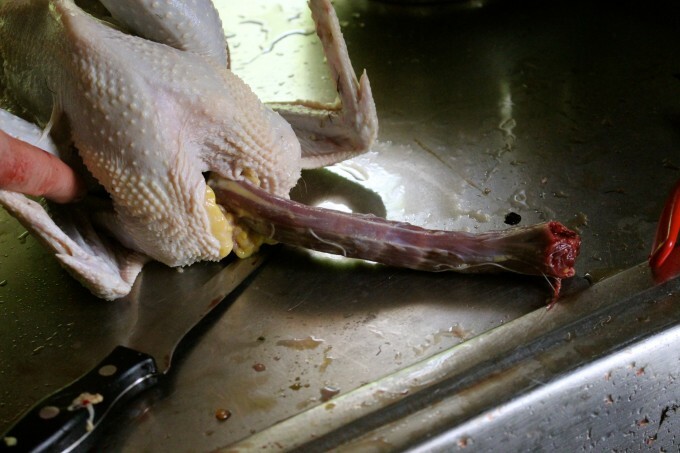 Step #18 – Put your thumb through the neck between the neck, crop, esophagus and windpipe. 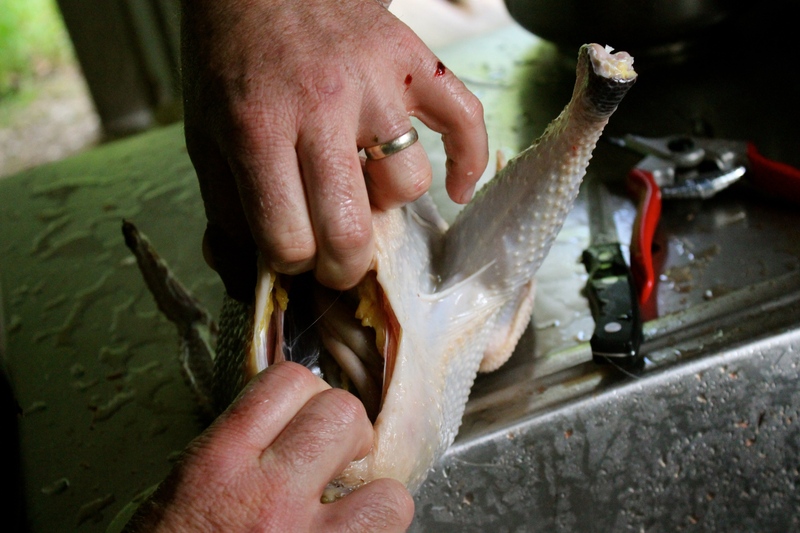 Step #19 – Pull the the crop and skin off. Step #20 – Cut the tubes close to the body. Step #21 – Cut the neck with your shears angled down from the body so there’s no bones to pierce future storage bags. Step #22 – Cut the oil gland off by slicing down and out. 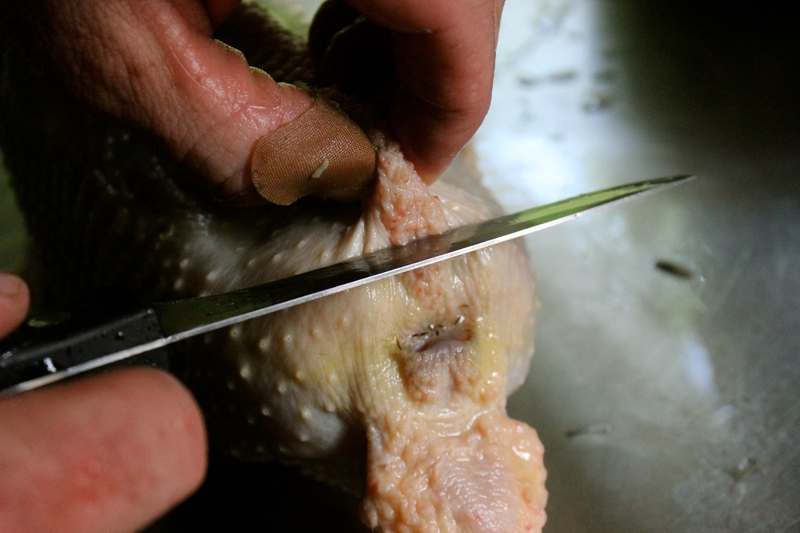 Step #23 – Make a small slit through the abdomen skin as close as possible to the vent so not to cut any entrails. Accidently cutting the entrails could mean cutting into the intestines and spilling out the bacterial ridden material. I ended up cutting just above the protrusion bones. Be sure to cut (not poke) as you don’t want to pierce any entrails. 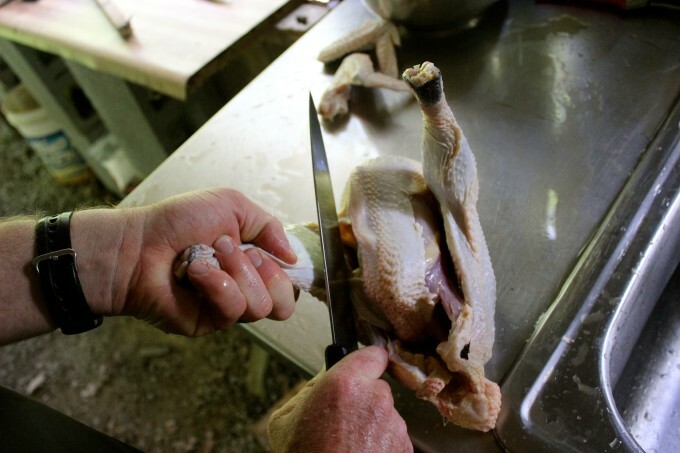 Step #24 – Open the carcass using both hands. Step #25 – Reach in, scraping against the rib cages with your finger nails, loosening the entrails from the body. Some folks may prefer to use latex gloves for this. 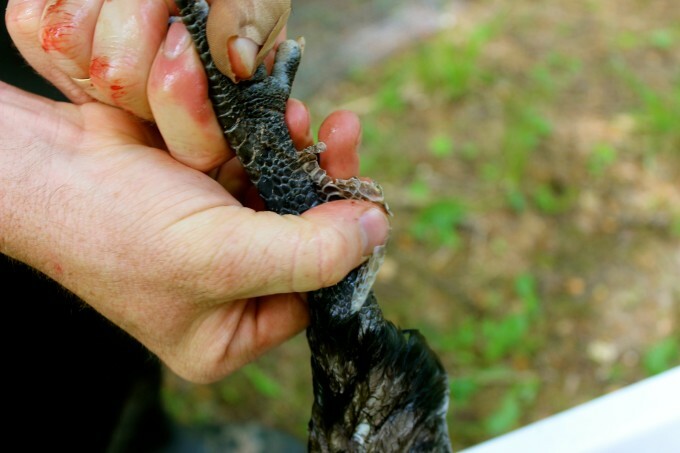 Step #26 – Hook the esophagus in your finger or just grab behind the entrails and pull them out altogether. 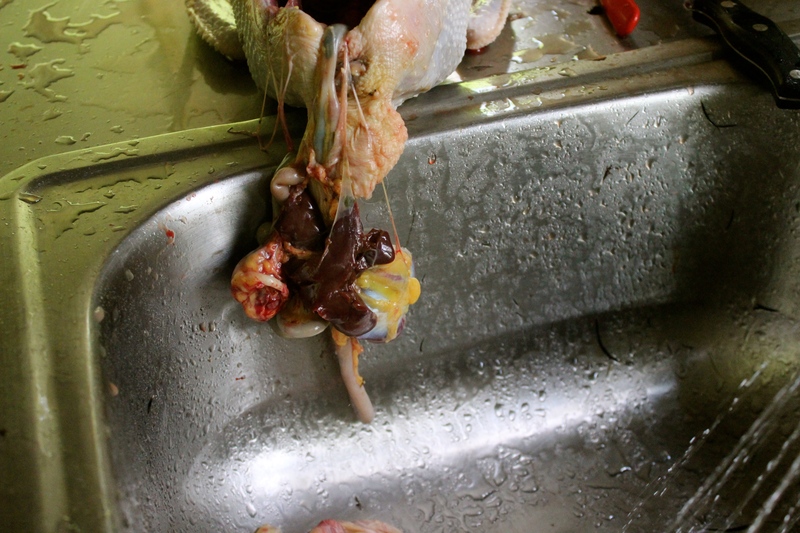 Step #27 – Rest the chicken on the sink counter while hanging the entrails into the sink. With the help of gravity cut off the heart and liver. I sacrifice some of the liver so not to cut the bile duct. If you cut the bile duct, it’s no disaster, just quickly rinse the bird. Step #28 – Put your heart and liver in your stainless steel bowl of cold ice water if you’re saving them. 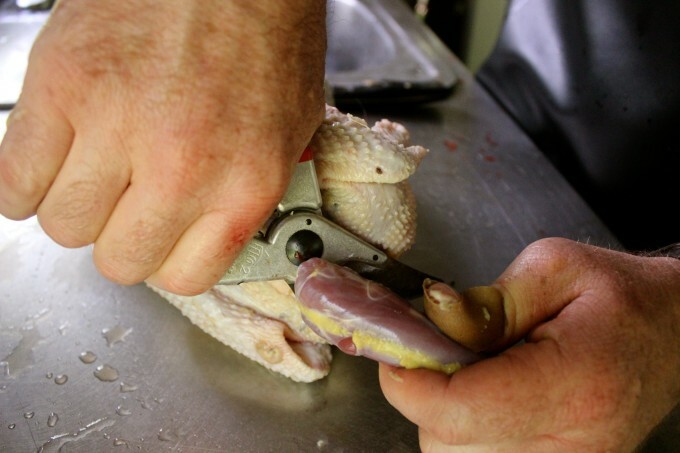 Step #29 – Cut away the gizzard. 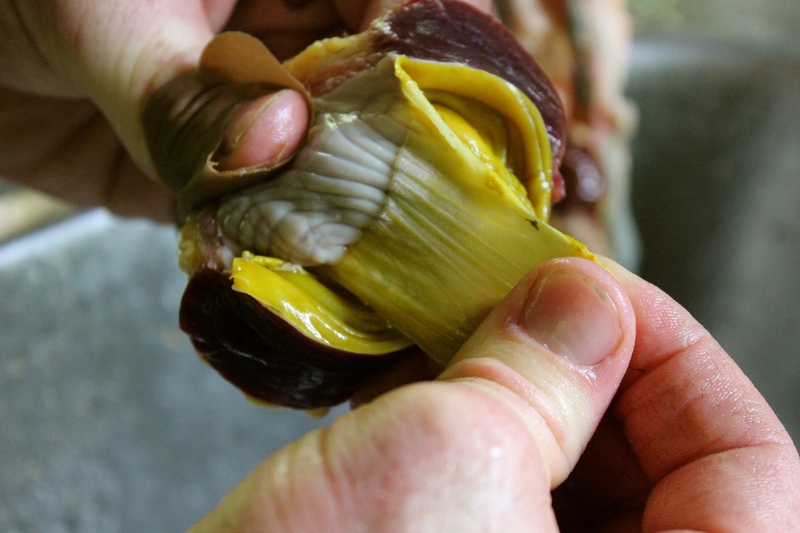 If you’re saving the gizzard cut it open long ways from one end and remove the insides along with the yellow lining, rinse and set aside. 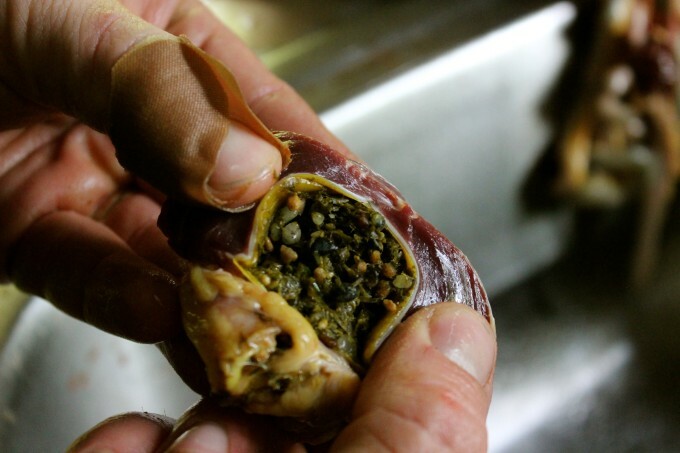 Step #30 – Save the testicles from males, for consumption, if desired. 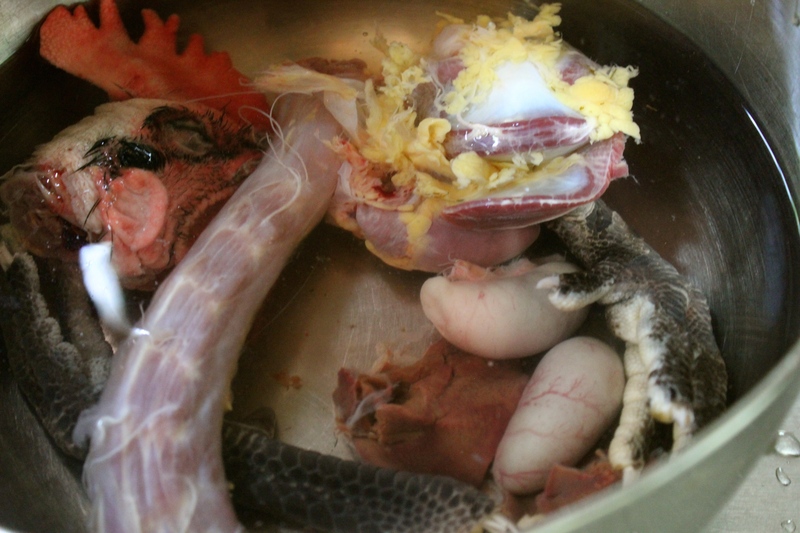 Head, Neck, Gizzard, Feet, Testicles, Liver are all edible and considered delicacies in many countries. 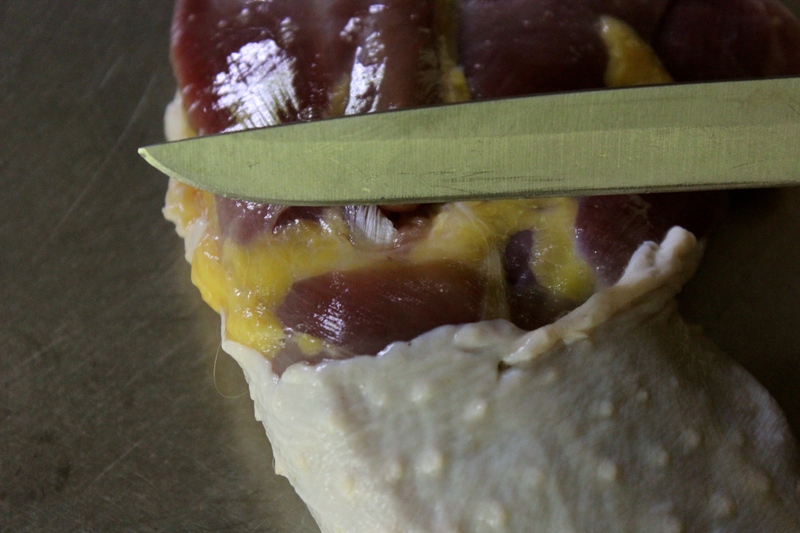 Step #31 – Cut away the entrails, cutting as close as you can to the vent in order to save as much fat as possible. Step #32 – Pull the lungs out. This can be a bit tricky and is hard to explain. Reach in and dig into the rib cage scraping the lung with your fingernails to pry them out. 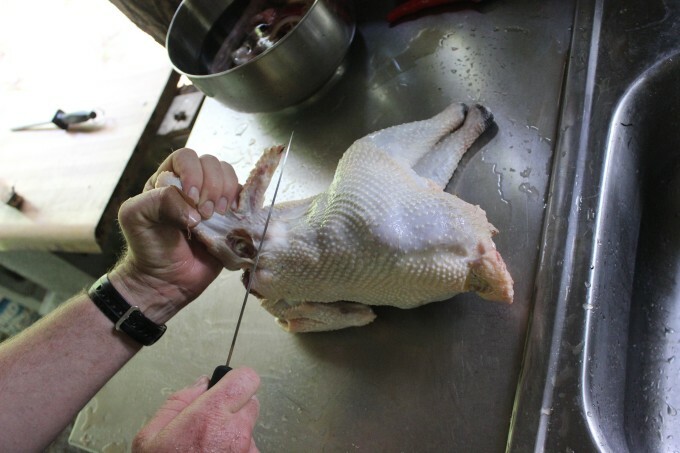 Step #33 – Rinse your bird and place it in the cooler. 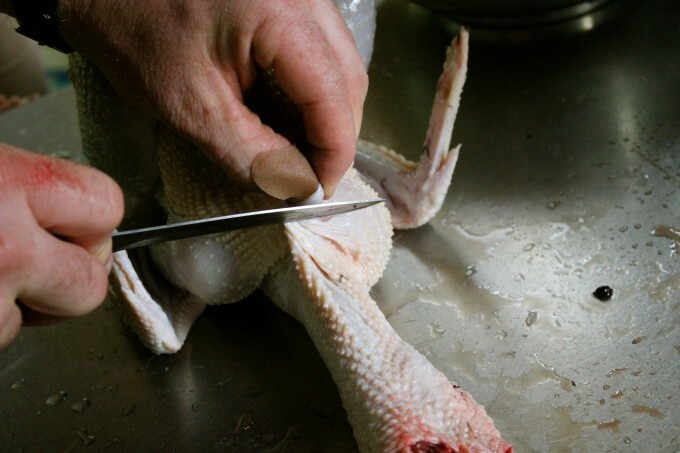 You can leave your bird whole or go ahead and cut it into pieces. If you want to cut it up, here’s one way to do it. Cut the wings by turning the bird on its side pulling the wing away from the body. Pull on the wing while you cut a half circle around the wing. 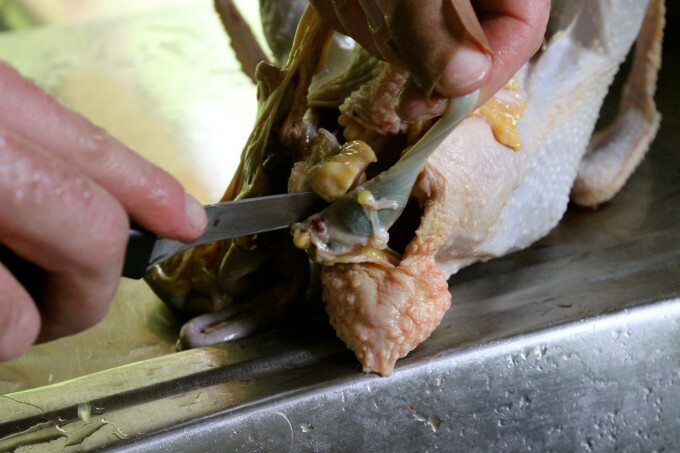 The wing should start to separate as you pull and cut and you’ll easily see where you can cut below the bone to remove the wing. I try and cut as close as I can to the wing as I’d rather have the extra meat on the breast, not the wing. 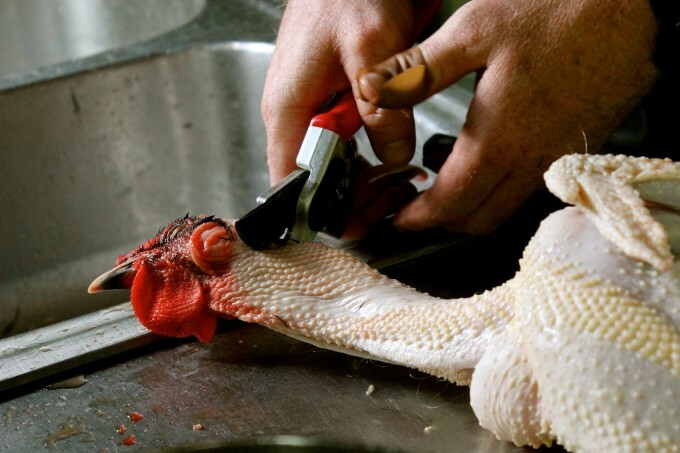 Cut the skin between the legs and the body by laying the chicken on it’s back and cutting as close as possible along the leg. Cutting close to the leg assures maximum skin coverage for the breast. I prefer to sacrifice a little skin on the leg as opposed to the breast. 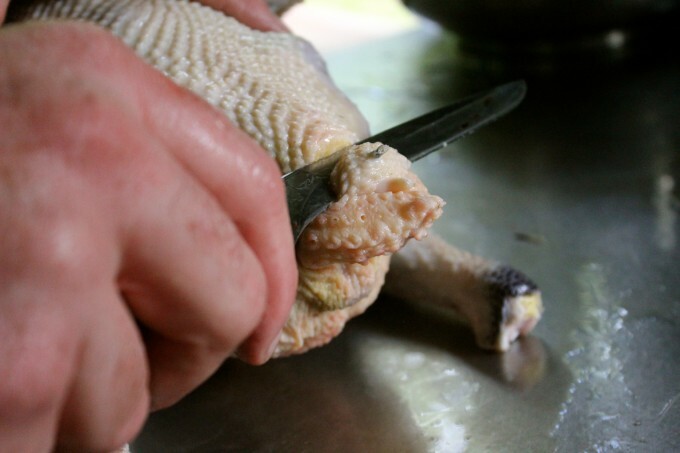 Take both legs, with the chicken to reveal the area between the joints for your next cut. Separate leg from thigh by cutting through the fat line. Remove the back by cutting down the fat line then bending and pulling to break and remove. Turn the breast over, revealing the bone. Score the bone at the center. Pop out the keel bone by bending the breast upward and prying it out. Dry off your chicken with towels. Place in storage bag and vacuum seal. Place in fridge for three days to tenderize the meat then stick it in the freezer for long term storage. Now that you’re finished butchering, I should mention how to get rid of all the un-wanted goods. 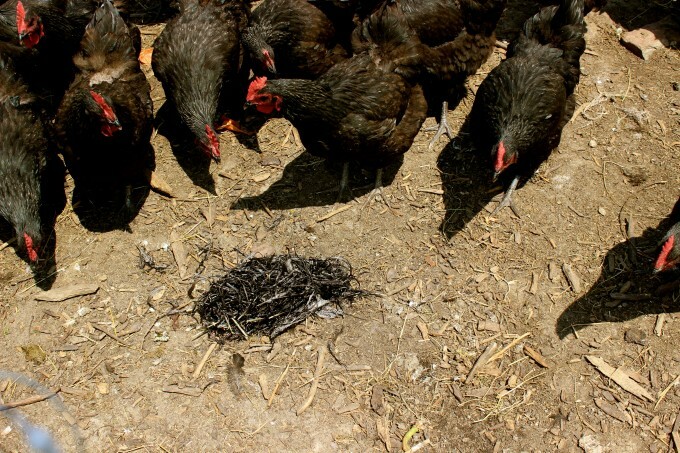 Feed the feathers to the chickens or compost them; feathers are full of protein and what they don’t eat will decompose adding to your deep litter coop or run. Compost the entrails, blood (if you’re not consuming it) and any other unused parts by burying them deep inside of a compost pile. 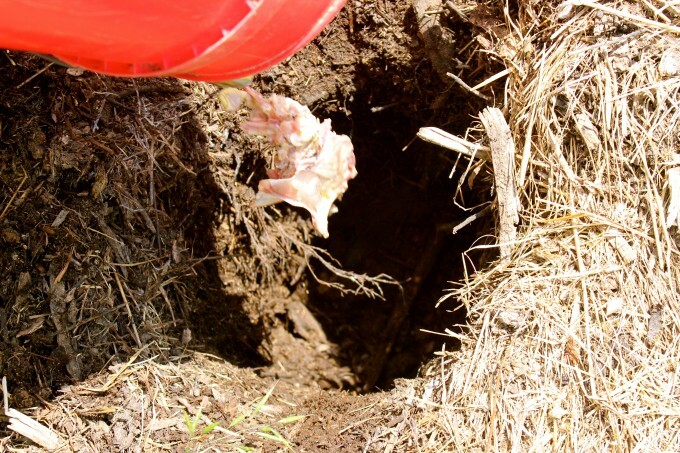 You must put them in deep (at least 3 feet) or unwanted animals will dig out your pile. Another option would be to dump the excess at the edge of your property to feed your predator population, helping to keep their hunger satisfied on something other than your live chickens. Ah.. the moment we’ve all been waiting for. It’s time to make our dinner. I’m telling you from experience that there’s few joys greater than sitting down at a table with friends or family to enjoy a meal from your own land. There are all kinds of ways to cook this chicken, but my families weekly “go to” is a simple bake. Spread two to four tablespoons of butter on the bird to keep moist during the bake. Bake at 350 degrees for one and half hours. We cook a couple of seasonal veggies and voila we’ve got a quick, easy and healthy dinner. This is what it’s all about folks! My list of butchering supplies. The Checklist I use to prep for butchering. Step by step instructions to take with you to the slaughtering table.